We have compiled this list of resources to help you learn more about securing and optimizing the performance of your PC. Computer Terminology - A basic guide to the lingo of computers. Useful for newbies to the computer experience. Answers That Work - Browse the library of Answers That Work for answers on all kinds of common errors that PC users encounter. PCHell - If you're in PC Hell, cruise on over to this website where you'll find practical advice, hints, tips, and troubleshooting techniques designed to get you back to PC Heaven. Help With PCs - Learn more about your PC and its programs at this website. You'll find an abundance of information here ranging from a glossary, tips and tricks, internet guide, free technical support, PC upgrading guides and PC maintenance guides. Dr. Keyboard - This UK based Q & A website has it all. You can browse for existing answers, post your own question or even chat live with Dr. Keyboard each week. ZDNet - Get free technical white papers, webcasts and case studies at ZDNet. You'll also get the latest technical news, product reviews, and the most extensive download directory on the net! Site Advisor - How do you know the website you are visiting isn't secretly spying on you, sends SPAM or has harmful downloads? You don't unless you have a free Site Advisor installed on your system. SlashDot - News for Nerds and Stuff That Matters - that's how SlashDot describes itself. Come here if you are a techie news junkie or if you want to get involved in the active community. Doc Scrubber - MS Word documents often contain extra information often called "Meta data" that includes hidden revision logs, last saved data, unique identifying GUIDs, comments, keywords, subjects, recent hyperlinks, revision counts, total editing time, last edited by, last print date and much more. While this data may be of some use in some circumstances, it also can reveal more than you wish about your documents. Use Doc Scrubber to scrub your MS Word documents clean of metadata. Microsoft Internet Explorer 7 - The new update to Microsoft's Internet Explorer addresses numerous privacy concerns. If you use any earlier version of Internet Explorer, update today and get advanced protection against phishing and malicious software programs. Mozilla FireFox - This is the most secure web browser currently on the market. It has very good plugin technology as well. A great source of information with well-written explanations of thorough troubleshooting procedures and step-by-step instructions for common PC updates and upgrades. This site has tons of great information about PCs, CPUs, and virtually any kind of hardware you need to deal with. The University of Texas at Austin offers an online library of links to great computer and IT resources. A great starting point for any tech newbie. Have any questions about your PC’s BIOS or its BIOS Setup program? This site is the definitive resource. Following the tips in this article can help improve your computer's performance. 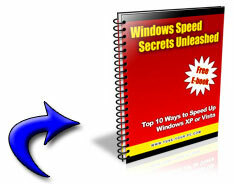 You'll find these tips work for all versions of Windows, including Windows 95, Windows 98, Windows Millennium Edition (Me), Windows NT, Windows 2000, and Windows XP. This site features an extensive collection of original support articles, links to other support sites, freeware utilities, registry patches and a great Shutdown Troubleshooter that's worth a visit in and of itself. If you're trying to figure out what Windows Resources really are and what all those programs running in the background of your PC really are and what they do, then you need to check this site out. This is another great site that has tips on getting around Windows startup problems and an even more extensive list of programs that run in the background. A great site that offers lots of very well-written "How-To" guides as well as links to many other excellent troubleshooting resources on the web. Ever been annoyed by some aspect of Windows? The site offer workarounds to lots of common and not-so-common problems. This site has resources that include lots of useful tips and tutorials for Windows users. Need the latest information regarding the IT world? Log on to this site to know what’s hot and what’s not. Excellent resource offering a lot of troubleshooting tips for your PC problems. You can find a growing collection of drivers here, as well as some useful troubleshooting tips for driver-related problems. Looking for a driver for an old add-in card? Or maybe the latest version for several new cards? This is great resource with lots of drivers that you can download for free. A very thorough online computer dictionary that not only offers well-written definitions of common and not so common technology-related terms, but also provides useful links related to the words you look up. Your resource for computer hardware and ‘how it all works together’. This site provides articles related to tips n’ tricks for tweaking your personal computer. It also provides news related to new tweaking techniques. A good site that provides the latest news about recent happenings in the world of computer hardware. Also has resources about optimizing PC performances. Simple, practical tips to help you work with your PC and the applications it contains. From PC security to how to make an email in MS Outlook, this site has got the answers for you. A really helpful article from Microsoft.com about troubleshooting your hardware problems. ARS technica provides a guide to troubleshooting your PC. A good article for solving common PC problems. Site has all the resources that you need to know about your personal computer. It has articles, discussion forums and many other resources about hardware, software and others news. Site has very good articles on current happenings in the world of hardware and software. Nice articles on solving common PC problems and optimizing PC performance. A good article about the ways to improve the performance of a personal computer running on windows XP. Complete with step-by-step instructions and numerous screen shots, even novice computer users can follow these steps. TweakGuides.com is devoted to providing you with a range of detailed tweak guides to help you understand and optimize your computer. Find out what MSConfig is and how you can use it to edit certain aspects of your PC. 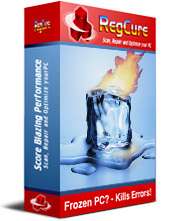 Download Your FREE Copy of RegCure. How to Fix Error Number 0X800CCC0E? How To Backup Windows Registry? What Is and How to Fix Rundll32 Exe Error? Copyright © 2008 Tune-Your-PC.com All Rights Reserved.